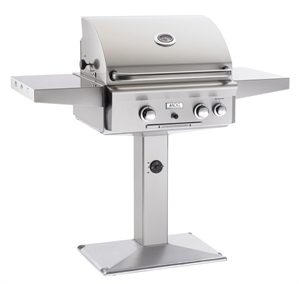 Full Description: American Outdoor Grill 24 Inch Grill On Patio Post: The American Outdoor Grill post model collection is designed for long lasting, unsurpassed performance that produces unbelievable flavor. All AOG in ground grills must be mounted in cement which are great for parks, condominiums, apartments and more! This AOG model includes a built in timer in the post (black knob shown in pic). After 3 hours, the natural gas supply automatically shuts off. Made in the USA and built to last, this AOG natural gas grill has quality features such as commercial grade stainless steel construction, long lasting stainless cooking grids, and highly sophisticated stainless steel burners that produce 32,000 BTUs. If you enjoy grilling veggies, steaks, and chicken all year long then you will appreciate the easy to start electronic push button ignition, dual side shelves for added shelf space, 432 sq inches of primary grilling space, vaporizer panels for even heat distribution, solid brass valves along with temperature controlled knobs to heat your food exactly how you like, a heavy duty warming rack to keep your food warm, a powerful 10,000 BTU rear burner with rotisserie kit thats capable of holding up to 15 lbs, and a grease management system for easy clean up. The beautiful satin finish hood, stainless steel construction, and custom designed thermometer with stainless steel bezel of this American Outdoor Grill will add style to any outdoor setting.